Archival quality gallery print in an acid-free matte, ready to frame in a 11 x 14 frame. Art area 8″ x 10″. Your artwork will arrive in a plastic sleeve along with care and handling instructions. Family of Bald Eagle nesting in National Arboretum. Part of a series of watercolor paintings. We work with scientists and doctors to create illustrations that make modern science accessible and relevant to everyone. For more information about creating custom illustrations, contact us for a free consultation and proposal. © 2004 – 2018 Ikumi Kayama / Studio Kayama, LLC. 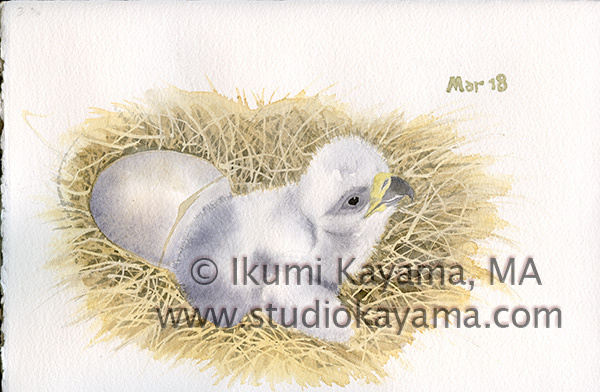 Please note that all contents and images on this site are protected by copyright law and may not be downloaded, copied, scanned, reproduced, published or altered in any way without the explicit written permission of Studio Kayama.